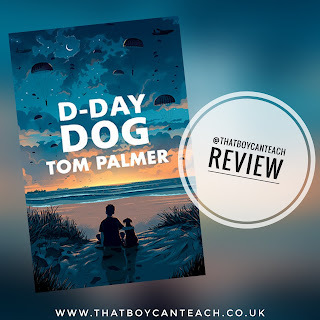 If you've read any of Tom Palmer's other historical novels - Over The Line, Armistice Runner, for example - then you will not be disappointed by D-Day Dog at all. In fact, you'll be blown away and left pondering whether, in fact, this is actually his best one yet. Reading 'D-Day Dog', you'd be forgiven for thinking that what you are actually reading is an accurate retelling of real life events, so thorough is the historical research that has informed this story. But that makes this brilliant book sound far too cold and clinical - here we have a story full of heart, warm and so tenderly handled. As with Armistice Runner, stories of past and present intertwine, only this time there are several threads running through: Jack's love of war simulation computer games, his dad's desire to fight with the TA in Afghanistan, a Falklands veteran's story, a Syrian refugee's experience of war and the story of Emile and his dog, Glen, who both parachuted into France on D Day during the Second World War. Jack loves his dog and when he has to do a project on a war hero prior to a school visit to Normandy he learns more about the part that animals, especially dogs, played in the World Wars. But things aren't great at home - his parents don't see eye to eye on his Dad's potential deployment - and Jack's perception of war is changing. What's the point? Why would a soldier choose to go into battle knowing he might be killed, or have to kill others? The crowning glory of this book is that Tom Palmer sensitively answers those questions - questions we've all turned over in our minds at some point - all through the perfect and powerful medium of story. Tom's inclusion, and positive treatment of, marginalised characters - a child who has a 1:1 learning support, a shell-shocked survivor of conflict in Syria, a boy caught in the middle of family tensions, a grizzly, grumpy old ex-soldier-turned-bus driver - is so natural - there is no shoehorning here. In fact, cohesion is the name of the game: all the strands mesh together perfectly to promote diversity, inclusion and understanding. What's more, published by Barrington Stoke's Conkers imprint for 7 to 10 year olds, this book is readable by design, allowing such serious subject matter to be accessed and explored by younger children - it's dyslexia-friendly too. With so much packed into a short read, there is ever reason for this book to be devoured left, right and centre. Get it on your bookshelves - at the library, at school, at home. The children need this.